An underground avant-garde venue and concert series running circa 1959 to 1964 in the backroom of one of Dublin’s first gay bars, Bartley Dunne’s (at the current site of Break for the Border on Stephen Street Lower). Bartley Dunne’s was modelled on Parisian left bank bistros and served throughout the late-1950s, 1960s and 1970s, in the words of Senator David Norris, as ‘a notorious haunt of the homosexual demi-monde’ (2012: 79). Dunne’s Dérives hosted outsider and semi-covert music, poetry and theatre events roughly once a month to a variety of patrons from the Dublin cultural scene as well as a host of visiting international artistic and musical figures. Although solid documentary evidence about activities at this world-within-a-world-within-a-world is scarce, oral testimony from surviving clientele and buried allusions across the historical record attest to a rich seam of fringe cultural activity. Former patrons Clancy Makem, Thomas McKenna and Brian Pace told me about concerts of experimental trad. sessions, modern classical chamber music and jazz, modernist poetry readings and even proto-free improv and electronic fusions in the vein of Group Ongaku, whose Takehisa Kosugi and Shukou Mizuno were said in an account of the group’s 1962 tour of the UK in The Wire to have visited the venue. Other notable visitors to Dunne’s Dérives, according to the most regular concert attendee of my interviewees, Pace, included Seán Ó Riada, the poet John Berryman, Brendan Behan and even composer Pierre Boulez, whom Pace described as ‘moonlighting’ in Ireland during a visit to the UK in the early-1960s. Participants in ‘cessasions,’ as the largely improvised performances at Dunne’s Dérives came to be known, were drawn largely from the ‘avant-garde’ clientele of Bartley’s (Sam 2013). This included members of the Irish wing of the then burgeoning Radical Faerie counter-cultural queer movement, literary and artistic modernists inspired by Russian Zaum, Dada cabaret and Irish literature (see below for a modern recording of a sound poem, Drumsna, Sam 2013 quotes as being performed regularly at the venue – the author is unknown, but the direction that it be performed “into a violin” has survived), as well as a pool of tinkerers from local theatre bands. The cast of performers was even said by Thomas McKenna to have included various pub singers and street wailers based around the Capel Street area of North Dublin, who in 1963 supposedly followed some rumours down to Dunne’s and became semi-regular attendees from then on in. The lack of boundaries around cessasion performances and the inevitable lack of pre-planning going in to them seem to have habitually led to them throwing up unexpected cross-disciplinary and cross-genre collaborations as well as fruitful stylistic inventions. Such things are indeed affirmed in the sole surviving review of one of these cessasions (see Appendix 2), written by Seán Flanagan and published in Hibernia in May 1963. The particular cessasion under review featured ‘performances…with the virility of a session but the refinement and opacity of the university, a blasted strange mix that brought new colours out of the music and the setting and the people.’ All of this amounted in Flanagan’s eyes to a ‘capsule history of various European avant-garde movements through a Hiberno-filter.’ Flanagan thought this a highly unusual concoction that he hoped would ‘spread beyond the small walls of the room and into Dublin outside,’ pushing ‘its staid concert scene into unexpected areas’ (all 1963:11). Although as noted the place of Dunne’s Derives in the historical record is precarious and piecemeal, it can be seen in the concert review just quoted and in the surviving testimony collected here, in the calibre of visitor the venue attracted and in the nonpareil range and flavour of culture whose existence it sanctioned, actually to have served as a crucial cog in the fragile chain of radical cultural practice in Ireland in the late-1950s and 1960s. 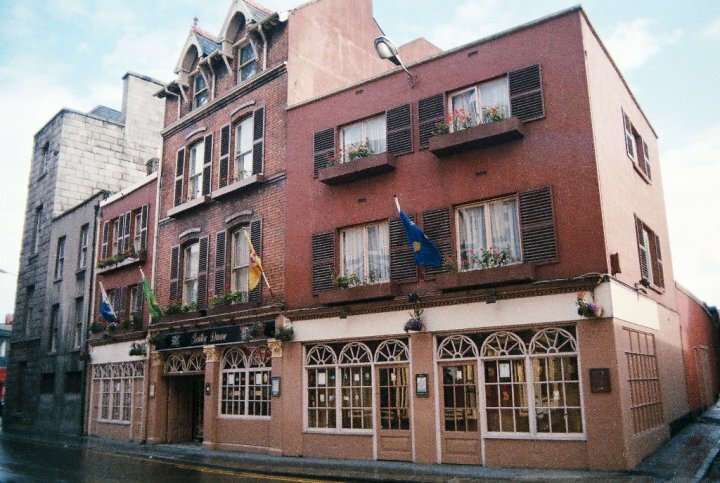 It not only provided respite for audiences from what today we would call the ‘glass closet’ of homophobic Irish society but also allowed various practitioners to bond together as the nucleus of a nascent scene, through this putting out vapour trails to Europe and beyond in a time of great artistic and social penury for Ireland. Activity at Dunne’s Dérives seemed in this way to brush aside the potentially constraining colonial burden of classical music and oppressive nationalist ideology of the corpus of Irish folk music. It promoted atypical social identities. It also looked towards America whilst also pursuing other cultural possibilities. In doing so Dunne’s Dérives pointed to a novel avant-garde Irish cultural identity sitting in a heretofore unidentified sweet spot across the past and present, and across America, Europe, Britain and Ireland. Had the vapour trails to scenes and cultures outside Ireland just mentioned been allowed to cohere into something more sustained and discernable Irish culture and even Irish society more broadly speaking would surely have felt substantial benefit. But that, alas, was not to be the case. The series and venue was closed down in December 1964 after Department of Defence censors accidentally picked up the thread of its existence whilst examining letters in a Censorship of Publications Board investigation into obscene pamphlets distributed amongst audiences at October 1964 performances of Philadelphia, Here I Come! at the Gaiety Theatre in Dublin (Bartley Dunne’s itself only narrowly escaped threat of closure after distancing itself from its basement tenants). Dunne’s Dérives therefore fell prey to the echo effects of a puritanical social apparatus only five years into its ultimately truncated and now near-forgotten run as the leading light of radical culture in Ireland of its time. Flanagan, Seán. 1963. ‘Music at Bartley Dunne’s’, in Hibernia, May, pp. 10 – 11 (Appendix 2). Hobbs, Christopher. 1979. ‘Group Ongaku and early British experimental music’, in The Wire, January. Lacey, Brian. 2008. Terrible Queer Creatures: A History of Homosexuality in Ireland, Wordwell. Norris, David. 2012. A Kick Against the Pricks: The Autobiography. Transworld Books. Personal interviews with former patrons of Bartley Dunne’s Clancy Makem, Thomas McKenna and Brian Pace, conducted in Dublin between May and July 2014. Smith, Sleuther. 1962. ‘An Eye on Irish’, Irish Press, 21 February.